In as little as 3-4 weeks PondBuilder can create stainless steel sheer decents that fit your design project. Sometimes the landscape design calls for low but wide waterfalls. In the past, multiple waterfall boxes would be required to build a wide falls. Today, you have access to sizes 12ft or larger. When one of the 4 in-stock Formal Falls sizes does not fit your project we will create custom sizes for you. 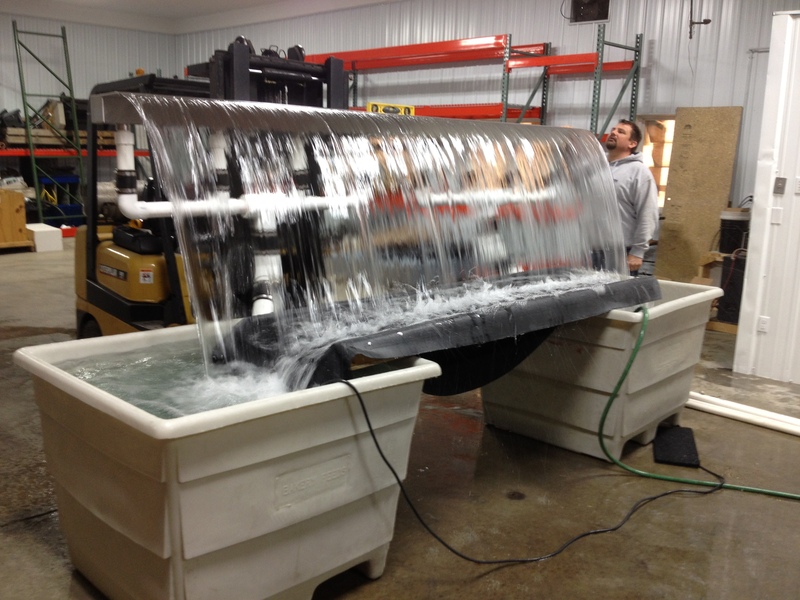 Let our designers work with your designers on your next custom water feature. Why use a custom size? -The 8" Mini, 16" Small, 28" Medium, nor the 40" Large work for you. -You need a radius, curve, or 90 degree angle. -You are working with thicker, wider, or more irregular block material. -You are building a water wall or vanishing edge water feature. PondBuilder takes your design, varifies buildability, collects concept drawings and produces a bid for construction. In 3-4 weeks a stainless steel Formal Falls will be created to withstand harsh salt\chlorinated conditions, heavy materials such as cement, concrete block, and 100s of pounds of weight per inch. 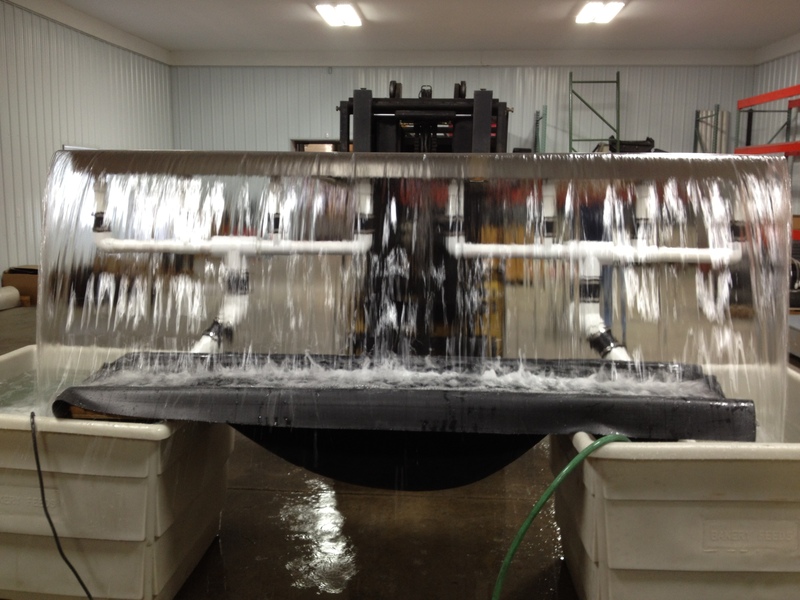 Custom Formal Falls typically require heavier gauge steel to be used: 16ga or 14ga. (2) 7,200gph pumps are delivering high volumn low pressure water to create a stunning 12ft Formal Falls display. Watch the video below for a live action shot. Stainless Steel can be used to create any number of designs for custom waterfall discharges. Each Formal Falls requires a particular flow rate to achieve the level of performance detailed by the illustrations and guide. Please note, for custom applications where the Formal Falls will be used outside of the standard kits, you will need to provide accurate information pertaining to the install to your supplier. Overall heights desired, proximity of the pump to the Formal Falls, and plumbing schematics covering all connections and sizing between the pump and the Formal Falls unit. Providing detailed drawings and specifications will ensure proper performance resulting in ideal flow rates through the Formal Falls.